NEW YORK – The World Jewish Congress today demanded that Amazon.com remove from its website books that deny the Holocaust and promote anti-Semitism and white supremacy. "No one should profit from the sale of such vile and offensive hate literature. Many Holocaust survivors are deeply offended by the fact that the world’s largest online retailer is making money from selling such material," WJC Executive Vice President Robert Singer wrote in a letter to Amazon CEO Jeff Bezos. "We are shocked and disgusted that Amazon has not yet removed these items, which came to light in news reports on October 14,” Singer said. Amazon.com’s vending of hate literature was exposed by 'The Kernel', a British web publication. In April 2008, the WJC asked Amazon.com to remove merchandise that glorified the Nazi regime. At the time, the firm complied. 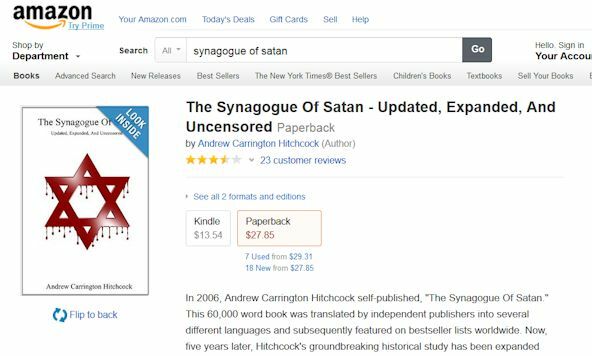 It has come to our attention that Amazon.com is selling books that deny the Holocaust and promote anti-Semitism and white supremacy. According to reports and our own investigation, these materials are even available to customers in countries such as France, Germany and Austria, where Holocaust denial is a crime and such texts are banned. No one should profit from the sale of such vile and offensive hate literature. Many Holocaust survivors are deeply offended by the fact that the world’s largest online retailer is making money from selling such material. We are shocked and disgusted that Amazon has not yet removed these items, which came to light in news reports on October 14. Please remove these items forthwith.